It’s winter and I have a fruit bowl full of navel oranges begging to be used. I cannot think of a better use for them than this wonderful cake. 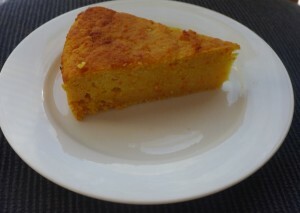 This recipe is a vegan version of a beautiful Sicilian/Sephardic Jewish orange and almond cake. Navels work best in this cake because they have no seeds to remove – the oranges are pureed whole. The only non vegan ingredient in the original recipe is eggs. While eggs are reasonably easy to replace in a cake, this one has a lot. Six in fact. So I approached it with some unease, thinking it would turn out like a brick. I need not have feared. It is a fairly dense cake, sort of like a pudding in texture, but so is the original. It is the easiest cake to make. It is really suitable to make vegan because it is such a fudgy cake to begin with. It doesn’t suffer from having the eggs replaced with a vegan alternative, as it doesn’t need the eggs for lightness like say, a sponge. The original is an old faithful recipe that’s been in my family for years. There are lots of versions of it out there, some with fewer oranges, some with and without flour. This is the one that seems to have settled in as my favourite. It is utterly delicious with its combination of nutty, bitter and sweet flavours. My only problem with this cake is I could happily scoff the lot at two or three sittings. Put the whole oranges into a saucepan and boil gently for 20 minutes. Put the whole boiled oranges into a food processor and blitz until pureed but with some small bits of peel still visible. In a bowl, beat the egg replacer with the sugar until smooth and fluffy. Mix in the almond meal. Mix in the orange puree. Fold the flour in gently and scoop the mixture into a cake pan and level it out. Bake in the oven for 45 minutes or until done. Insert a skewer and it should come out cleanly when done. If it isn't give it another 5 minutes. Cool in the pan for at least 20 minutes before turning out.